Traditionally, in times of uncertainty, investors look to developed market bonds, currencies and gold in particular as safe places to preserve capital. However, the current environment has left many investors concerned over the few places available to safely invest. At present, the conflicting monetary policy outlooks of the US compared to the rest of the developed world have delivered more volatility than the desired results of growth and inflation. The US has looked to normalise interest rates, whereas Europe and Japan are further easing monetary policy. The extent of easing in Europe and Japan has seen benchmark interest rates fall into negative territory, an environment quite alien to the markets. This has extended to developed market yield curves, with close to $12 trillion of the global bond market trading below 0%. Simply put, in these circumstances your capital is expected to deteriorate over the life of the bond. Furthermore, if yields were to rise to more normalised rates, these bonds would make significant capital losses. This has understandably caused much fear and uncertainty in areas investors have traditionally viewed as safe havens. South African bond yields rose significantly towards the end of 2015 due to political instability and fears that the low real GDP per capita growth outlook would result in an inevitable downgrade of our investment grade credit rating. The first half of 2016 reflected much of this sentiment, with bond yields remaining higher and the rand weaker as a result. The market, reflecting short-term thinking, has priced for inflation well above the South Africa Reserve Banks’s (SARB) 6% target, and bond yields are reflecting a below-investment grade economy. The local economy, while still a long way away from being out of the woods, has made measured progress towards averting initial fears of becoming the next Brazil or Russia. However, local asset prices have remained under pressure against the global backdrop of low growth and inflation, contradictory monetary policy in large economies, fears around Brexit and negative global bond yields which we believe do not reflect the positive steps taken domestically. A ‘through the cycle view’ of bond yields and the economic cycle speak to the nature of the asset class, which is driven by expectations of inflation, growth and sovereign risk. In South Africa the growth outlook is poor and the market is currently pricing in significant sovereign risk. Understanding inflation, which is managed by the SARB, is therefore key to developing a long-term bond investment case. Since the start of inflation targeting in 2000, the SARB has managed CPI at an average of 5.6%, within their target band of 3% to 6%. We believe that the SARB has been credible in their monetary policy – a viewed shared by the credit rating agencies. The outlook for inflation, while currently on an upward trajectory, is expected to remain anchored at around the 6% mark over the medium term in an environment of low credit extension and muted consumer demand. We therefore believe that local bond yields have offered – and continue to offer – a mispricing as a result of global forces and expectations of currency weakness. Local bonds currently price in inflation expectations of roughly 7% over the medium term, which we believe may be excessive. As expected from the asset class, bonds have shown more stability for investors this year than compared to their more recent history and we believe the market is beginning to reflect the view that SA bonds are attractive. Following the result of the Brexit referendum, South African bond yields were expected to spike far beyond the increase noted on the day. The 10-year yield rose from about 8.8% to about 9.2%, but was quickly bought back down as demand was strong. The demand was noted as having been largely driven by foreigners taking advantage of market weakness, with foreigners having bought about R52 billion worth of local bonds this year at the time of writing. The reason is clear from the graph below, which reflects the current yield differential between our local bonds and the traditional safe haven assets (US and EU bonds). 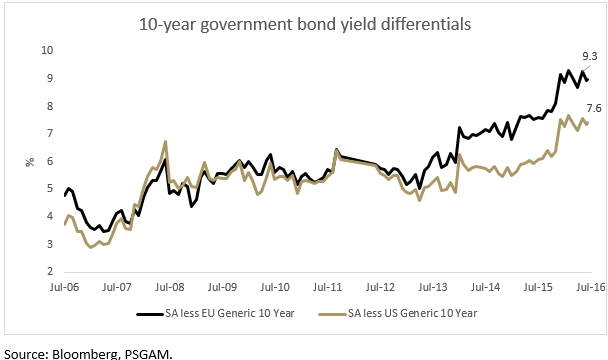 Around the end of June this year, the spread of SA 10 year bonds was roughly 7.5% to US 10-year bonds and 9.3% to the generic EU 10-year bond. This we view as attractive to local and foreign investors, offering real yield and a margin of safety against global risk. We firmly believe that long-term investment returns are made in times of uncertainty, as the market tends to focus on short-term sentiment. It is evident that the risks associated with the traditional safe haven of developed market bonds has risen significantly since the 2008 financial crisis, while in our view the margin of safety available to investors in SA bond yields has increased. It is our view that South African government bonds currently offer a measure of mispricing relative to the global economic outlook of uncertainty, low growth and low inflation. SA bonds also offer protection against a growing trend of global disinflation, a diversification benefit which we believe investors should factor into their asset allocation decisions. The associated margin of safety, real yield and opportunity for capital gains are currently presenting an attractive investment case. Disclaimer: Please note that this article should in no way be construed as financial advice. 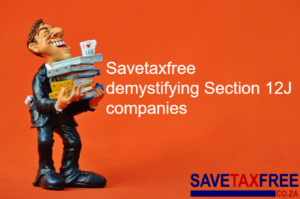 We believe that readers should always discuss any investment they intend making with a registered, qualified and experienced financial adviser who will assist them to select products which are appropriate based on their financial position, risk profile and needs. The PSG Angle is an electronic newsletter of PSG Asset Management.